When using School Loop Plus, users granted Grade Export Status rights are allowed to see whether the teacher has already submitted their grade reports. 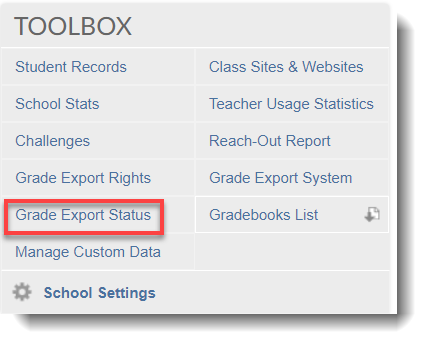 Login to your School Loop account and click on Grade Export Status under the Toolbox menu. Click Export Status from the appropriate Marking Period or Code. The bottom list will be the most recent grade that has been submitted. Teachers who have submitted grades are listed in the right column. The left column lists teachers who have not yet submitted grades. Click the envelope icon to send a reminder email to (a) to all or one (b) teacher who has not submitted grades. Create Print Report - lets you view all submissions made by teacher/s. A check mark beside a student's name is an indication that the grade has been imported to SIS. Allows you to view submission date and also which Marking Period it belongs to. (d) Click the Create Import File button to save the import file on your hard drive. You may change the file name, but do not change the extension (slgrd or csv). Grade Export files are set up by users granted with Grade Export System rights.